Saturday, 5th March. It was a wonderful morning to start off the 4th Victorian Soccer Challenge. The sky was cloudy and cool breeze could be felt by everyone who came early for the tournament. By 8am, Victoria School’s carpark was filled with our old boys’ cars and motorcycles that came down for the tournament. The free prata breakfast was also a nice surprise to this year’s tournament. I am sure those who had the pratas greatly appreciate them. After 4 years running, there were some familiar faces from previous tournaments. However, I am glad to see new faces. It was a delight to see that this soccer challenge had grown in popularity and brought more and more Victorians together. Even though everyone was eyeing for the 1st prize medal, I am sure that the bigger ‘win’ was being able to meet up with old schoolmates. It was nice to know how other Victorians had succeeded in their life and is going places now. The tournament went off to a roaring start. Even though the boys were gracious in their pleasantries in the morning, there was no love lost when it came down to the pitch. Being the Victorians (thy sons are we), the spirit of competition still lingers in our soul. It was heart warming to see the older generation still playing with great gusto and the younger generation following suit. The tackles were coming in hard. The shots were fired with great tenacity. The boys ran up and down the field leaving a trail of blaze. It was like as if age did not matter to us as we are all Victorians at heart. At the end of the match, the boys were gentleman enough to laugh it off and shake hands despite the loss. It was also a great but very much enjoyable and pleasant surprise when the VS Band came to (literally) drummed up support not only for their Seniors (the Bandz Bazookas) but also for the other teams that were playing thereafter! During the knock out stages, the unforeseen heavy downpour put a halt to the tournament. It rained for almost an hour but by some grace, the rain stopped and the tournament resumed. We thanked the competing Teams for being gracious and patient. The tournament came to an end around 6pm. Despite the tiredness, it was great to see the winners capable of putting on a smile for the cameras. I congratulate the winners and I thank the other teams for coming down. This event will not be possible if not for all of you. I look forward in seeing all of you in the next Victorian Soccer Challenge next year. Mr Low Eng Teong (VS Principal) for letting us to use the field. Mr John Yap (Gombak FC Chairman), Mr Sng YK (VS Sports Sec), Mr Zabid and Mr Nathaniel (VS teachers) for helping us out in the event. Our guest team, VIOBA for coming down from Malaysia to Singapore just for the event. Lastly, thanks to every participating teams. This event was made possible because of all of you! Keep the spirits alive and see you all next year! Thanks for the report Aizat. It’s worthy to note that the response for this year VSC were really overwhelming, thanks to the publicity generated by the ‘V1CTO3IAN5 Day’ Team. There was even a request to send in a Team, a day before the event. 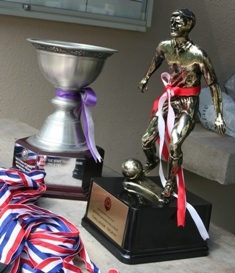 This year there were 2 Challenge Trophies and they are the Victoria Soccer Challenge Trophy for the Open Category and the Rettnam Pierre Cup for the Senior Category. It was really a heartwarming sensation to witness Victorians who’ve not met each other for years but yet immediately ‘clicked’ and started to talk about whatever that they talked and that includes the players from VIOBA! OVA President Vernon Teo, OVA Management Committee Members and the ‘V1CTO3IAN5 Day’ Committee Members. VS Photographer, Sec. 3 student, Shamil – who willingly stayed back despite the temporary suspension. Fellow Victorians, Seat Teck Meng, Dexter Chua and Puar Si Wei – who sacrificed their time on the eve of VSC from 4.30pm till 8pm at VS Field, to do the setting up. Fellow Victorians, David Law, Lee Ming Hui, Jeremy Han, Andy Yong, Kumar Krishnan and Aizat Omar – who came as early as 7.30am on VSC day itself and left VS at 7.30pm to run the VSC smoothly and also for staying back after the prize giving ceremony to tidy up whatever that needs to be tidied up! 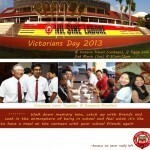 Victoria Institution Old Boys Association – for making the trip despite the short notice. 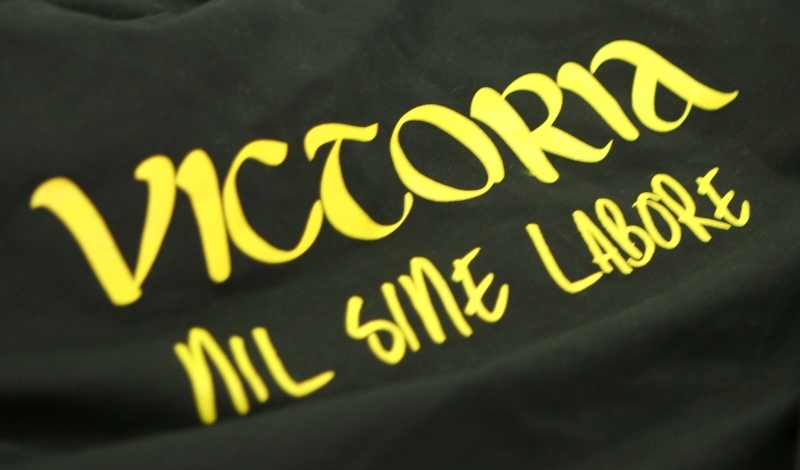 And to ALL Victorians and Guests for spending the day with us! 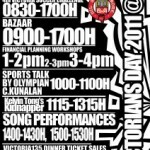 And as highlighted by Aizat above, when the VS Band made an impromptu appearance to drummed up support, there were many but ALL pleasant comments and queries, but credit must go to the VS Band themselves and also to the Bandz Bazookas Team led by Lim Eng Chong, as we were also completely unaware! It goes to show that the ties and bond between Victorians, past and present, are strong and will remain ever so! On a last note, on behalf of the VSC team, I humbly apologised for any shortcomings in the way the VSC was organised and managed. We welcome your comments, if any.